There is «Lake of Youth» 3km away from our hotel. It is the largest ornamental water in Ukraine. «Lake of Youth» is 140m in width, 750m in length and depth in some places — up to 8m. It has well-organized beach (with chaise longues, sunshades, changing rooms and outlets), the length of which is 2 km. In summer you can ride on water skis, catamarans, jet and others. Those interested can visit the diving school or fly on FlySurf. For the smallest tourists water slides and other entertainment are provided. 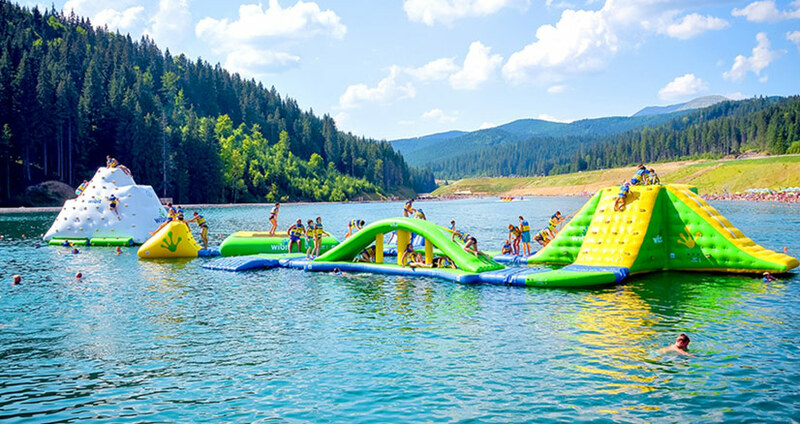 It should be noted that for the safety and comfort of our tourists, «Lake of Youth» is divided into area for swimming and for water attractions. Lifeguards and professional instructors work throughout the area. The special feature of the lake is water – it is so clear that in fair weather in some places you can see the ground. 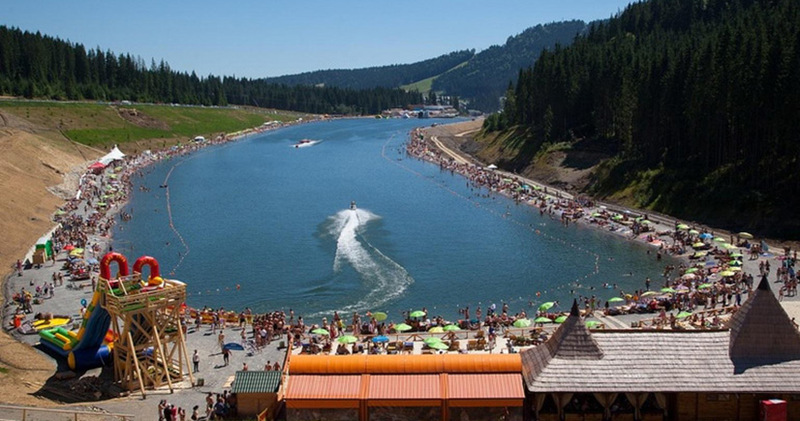 In winter in Bukovel «Lake of Youth» performs a different function: water is taken from it to create snow. At «Lake of Youth» lakeside is situated the unique VODA day & night club complex. There is an inflatable water park, a large swimming pool with sunbathing terrace, 4 jacuzzi and Roman steam bath, Finnish and Mediterranean sauna,a salt cave and a large gym with zones for boxing and yoga. In the evenings are held different shows, discos and parties with the famous stars of Ukrainian show business. FlySurf — exciting water attraction, which could combine the two elements — water and air. Introductory flight (5 minutes) will cost 390 USD, 10 minutes — 690 UAH, 20 minutes (two 10-minute sessions) — 1290 UAH.